Our most recent study on how pore size, morphology and orientation have an effect on stiffness of a porous alloy has been published in the Journal of Materials Engineering and Performance. Our article ‘Effect of Pore Size, Morphology and Orientation on the Bulk Stiffness of a Porous Ti35Nb4Sn Alloy‘ describes how the metal foams of a titanium alloy were designed to study porosity as well as pore size and shape independently. These were manufactured using a powder metallurgy/space-holder technique that allowed a fine control of the pore size and morphology; and then characterized and tested against well-established models to predict a relationship between porosity, pore size and shape, and bulk stiffness. Among the typically used correlations, existing power-law models were found to be the best fit for the prediction of macropore morphology against compressive elastic moduli, outperforming other models such as exponential, polynomial or binomial. The new coefficients reported in this study contribute toward a design tool that allows the tailoring of mechanical properties through porosity macrostructure. The results show that, for the same porosity range, pore shape and orientation have a significant effect on mechanical performance and that they can be predicted. Conversely, pore size has only a mild impact on bulk stiffness. weight. A designed microstructure is able to produce similar strength and stiffness values to a homogenous material at a reduced weight by removing discontinuities between phases where stress concentrations occur. Joe Holt, researcher of the Multifunctional materials Lab, studying at the EPSRC Centre for Doctoral Training in Embedded Intelligence and co-sponsored by FAR UK Ltd, has presented our work on functionally tailored cellular structures via topology optimisation. density in specific regions, producing a finished structure with a density profile representing the results of the topology optimisation. Wilson A. Bentley (1865-1931). This gentleman studied the formation of snowflakes under varied conditions of temperature, pressure and relative humidity. With rather low-tech scientific apparatus (i.e. 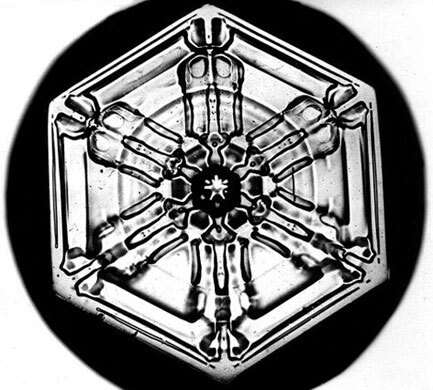 a simple microscope and rudimentary equipment to control temperature, pressure and % humidity), he created hundreds, if not thousands, of snow crystals. He coined the sentence “no two snowflakes are the same”. If it is snowing where you are now, look out of the window and pay attention to the snowflakes. It is not that all the different snowflakes that you see falling from the sky are all absolutely unique and different. His claim means that, under specific atmospheric and physical conditions (i.e. 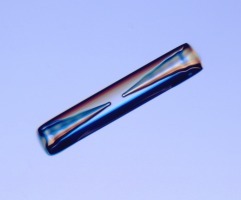 T, P, %hum, altitude, etc), one and only one type of snow crystal will form, and then fall onto the ground. These images are original photographs taken by Bentley himself using his microscope. 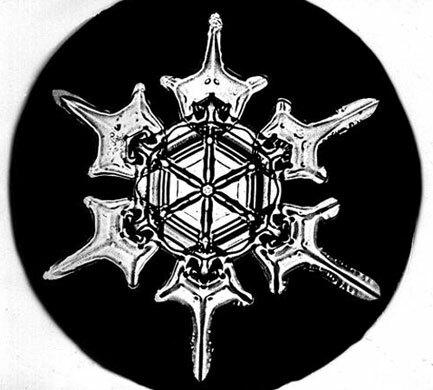 The crispness of the images is breathtaking and the beauty of the fractals extraordinary. Enjoy! For example, when snowflakes crystallises with the shape of a tube or a needle, fall to the ground and form a layer of snow on a mountain, that layer may be the precursor in the formation of avalanches. Bentley’s pioneering work has helped geophysicists and engineers understand ice formations and how to prevent catastrophes. However, there are many questions still unsolved! Snowflakes grow as thin plates, but if the temperature varies only a few degrees, they evolve into long thin crystals. No one knows why. 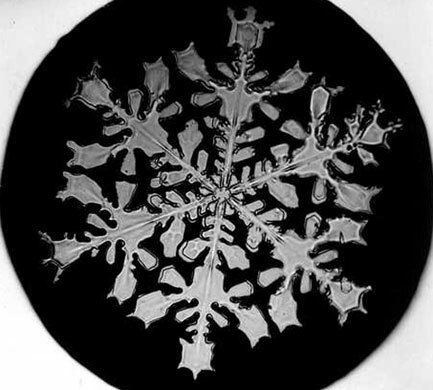 This last image belongs to a collection from SnowCrystals.com and a beautiful classification of the different types of snowflakes can be seen here. We have created new structures that provide comfortable accommodation for bone-forming cells. We seeded them, puffed up their pillows, fed them with their favourite food and drink and waited. The other day we went to check on them. This one looks particularly pleased! We have published our most recent results on how porosity and pore size affect both mechanical properties and biological response of osteoblastic cells on titanium porous structures. Working with volumetric porosities that match those of cortical and trabecular bone, we finely controlled the pore size in the substrate with the aim to assess how a variation in pore size can tailor mechanical properties (i.e. stiffness and strength). Furthermore, we report how we could establish regressions that would allow us to create a design tool based on porosity, so it would return the desired mechanical properties values. From a bioengineering viewpoint, the results from this study showed that scaffolds with the lowest pore range (45-106um) presented the largest number of cells attached in the early days (day 1 and 3) indicating this microarchitecture was the best indicated for cell attachment. Pore range >300 mm exhibited the most favourable conditions for cell proliferation, surpassing those on the control samples. The viability of scaffolds with pore size 212-300um was the poorest, indicating these scaffolds do not promote cell proliferation for osteosarcoma osteoblasts due to the distance the cells had to span. The study can be found here in the Materials Science and Engineering C: Materials for Biological Applications. We have published the results arising from our studies on open cell polymeric foams that can be tailored so that they support those who are bed bound or wheelchair users providing them with general well being and alleviating pressure points. Avoiding pressure points, managing sores and permitting air permeability are the three main design specifications that clinicians aim to when choosing a cushion. In addition to that, a functional cushion, such as those who support lateral movements (e.g. leaning sideways to grab a glass of water and be helped to return to your initial position without compromising one’s stability) and protect from vibration and impacts (e.g. dropping off a curb), are the focus of our research project. The Multifunctional Materials Lab and clinicians from the NHS have studied how we can help their clinician colleagues understand cushion performance and therefore aid them with the prescription of these to patients and users. The results from our study have been published in the Medical Engineering and Physics Journal and in the Assistive Technology Journal . The International Standard that regulates developments in this topic is the ISO16840-2:2007, which is currently under revision. We are hoping our work to inform their work and assist in their revisions for the replacement ISO 16840-2.